Isn’t it incredible how life gives you the things that you need when you need it? I wanted to learn Chinese martial arts since I was a little girl. My father unknowingly tempted me by playing kung-fu movies on the weekend. While sitting on the hard wooden floor of our home, I would watch in amazement as many on-screen martial artists performed their choreographed art. But, I was a girl. I was encouraged to do things that girls normally do such as sewing and calligraphy; definitely not hanging upside down from the maple trees in our front yard, let alone martial arts. Perhaps my parents were trying to keep me from getting hurt; bless them. So, in the whirlwind of studying and establishing a career in IT, I left that dream behind. In my 20′s I enjoyed the benefits of using a body that seemed to have an unlimited supply if vigour. I indulged in aerobics, weights, strength and conditioning training, cycling, and more. Then I strained my shoulder when I tried Brazilian Jiu-jitsu in support of a friend who opened a gym. It was not a major injury. However, it made me realise that I needed to put my effort into something that taught me how to use my body before I sustained a bad injury. I wondered how I could better understand my body while engaging in an activity that I enjoyed. This brought me back to my interest in martial arts, which I pondered on for years up until the arrival of my son. Taiji!! It just popped into my head one day. It balanced a long lost interest in martial arts and a growing need to maintain a healthy functional body. I watched YouTube video after YouTube video for months to determine if taiji was the way forward but believed I needed to experience it to make a decision. Although all the videos about silk reeling and rolling around with big metal balls looked enchanting, it was not obvious to me how that could help me use my body correctly. Master Chen and Hong Junsheng’s demonstrations, however, produced visible results of opponents toppling from a seemingly small touch. Also, the language of Master Chen’s instructions really appealed to my practical side. After consulting some family and friends, I went to my very first Practical Method class in August 2015 in Sydney. My martial art practice begins! I learned PM from Master Chen’s disciples, Paul Janssens and Brian Chung. I also had so much guidance from my fellow taiji brothers and sisters who are more experienced and had been to the mountain (大清山). 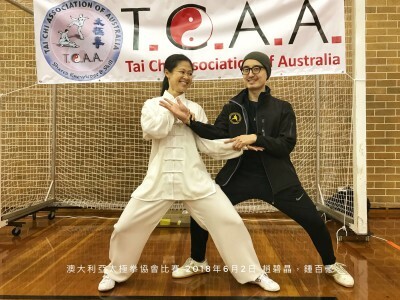 I had the opportunity of attending four of Master Chen’s workshops in Sydney from 2015 to 2018 and received two private form corrections from Master Chen. During this period in my life, I also left my corporate IT job to study nutrition and spend more time caring for my family. In 2018, I took the plunge to enter the Tai Chi Association of Australia competition and performed a condensed version of the Yilu. You know what was the most amazing part of this experience? After performing the Yilu people came and asked what style I practised. It allowed me to share PM with other taiji enthusiasts. I feel that I am progressing slowly, but that is from my own lack of consistency with practice and study. Not from a lack of quality instruction. Along with my spiritual studies, PM has slowed down my erratic and frantic pace. I am more centred. I enjoy taking time to observe life and the interactions around me before responding. My body has also opened up in different ways that regular stretches could not produce. I am so glad I made the decision to learn PM and will continue to strive for improvements and regular practice. One day I hope I will be competent enough to share PM with others. In particular, I hope I can share PM with disadvantaged youths as a method for them to uplift themselves towards a better situation inside and out. Only more practice and time will tell. Thank you to Master Chen and his disciples for sharing everything that they know. Study – Currently studying Bachelor of Food and Nutrition at La Trobe University. Previously completed Bachelor of Engineering (Software) at Sydney University and MBA (Finance) at UTS. Work – Currently undertaking casual work training adults and children on basic cooking skills with a not-for-profit organisation. Previously worked as an IT business analyst in banking, and project management and account management in online marketing.